WooHoo!! LOTS of new stamps are being released over the next week!! First off - CC Designs is releasing 2 new Little Bits Kits - Love Ya Lots and Love Ya Much (mine haven't arrived yet but they are CUTE! - you can check out the ATS gallery here and see what the other DT members have done with these sets so far). You can get these sets at All That Scraps at midnight TONIGHT! And you can see the full sets right now here. Also being released tonight is a new Hanna Stamps set! You can see the set here. And can get it here. GinaK Designs is releasing SEVERAL new sets on Saturday night - you'll be able to see (and buy) them all here. There will also be a release party in GinaK's Forum on Splitcoast Saturday night so be sure to stop by! Gina's also started posting some sneak peeks on her blog of the new sets - you can check them out here. Here's a card using stamps from the soon-to-be-released newest Hanna Stamps! set. The set will be available HERE on November 16th. I only used 3 stamps from the set - Hanna, the splash by her feet (it's a separate stamp so you can use it wherever you want) and the little worm (who is SO freaking CUTE!! I HAD to use him twice on this card). The sentiment is from Papertrey's Faux Ribbon set (enhanced with the worm of course) and I punched it out with my Extra Jumbo Scalloped Circle punch (the yellow one). The patterned paper on the base is all from the Amy Butler Pack. My new Tis the Season set from Hanna Stamps just arrived and I HAD to ink it up ASAP and play!! The patterned paper is from Chatterbox (Nordic Flowers from the Chalet collection) and I stamped Hanna's skirt onto a piece of it and cut it out (ie: paper-piecing). The rest of Hanna and the tree was colored in with Copic Markers. I used a black marker to draw in a little more "snow" on the ground, then used a 2-way glue pen to add Dazzling Diamonds (Stampin'up!) glitter to the image. The snowflake brads are from my local scrapbook store, the ribbon is Offray brand from WalMart (the bow was tied separately and then adhered with a mini glue dot). FYI you can get Hanna Stamps HERE <----click!! The newest Hanna Stamps! stamp set was released today - you can check it out HERE <----click! on Kristi's blog. It's an adorable set - sorry I don't have any samples to post with it - my set hasn't arrived yet! Once it does tho I'll have something stamped to share with y'all!! Ooohhhh I'm really loving this stamp set!! FYI for those that asked yes there is only one Hanna Stamps! set so far - as of right now the plan is to release one new set a month. 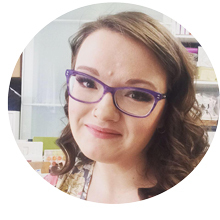 You can find out more about Hanna Stamps on Kristi's blog here. I stamped Hanna's dress onto one of the sheets and cut it out, I also cut out one of the shopping bags. I then proceeded to do the same thing with some of the other patterns and all the shopping bags. I then stamped Hanna onto white CS, colored her in with Copic markers (and yes I had a little fun with her hair - it was originally more blond and then I kept adding brown streaks and then darkened it all to a more light brown/dirty blond color LOL!). I was REALLY pleased with how it all turned out once I got all the different pieces of patterned paper adhered to the main image - I usually don't do this much paper-piecing - especially with so many different pieces - and I wasn't sure how it would turn out. But you can see it all came together great *big grin*. I used a brown Copic marker on the trim of her dress and the handles of the shopping bags. The ribbon is also daisyd's and I cut slits through the main image with my Basic Grey Notch and Die Cut Tool so that more of the ribbon would show through. The scalloped edge was made with SU! 's 3/16" corner rounder punch, then I added some A Muse Mini Dot Twinkle Stickers to each scallop. The flower (another daisyd's goodie) was attached with a jumbo sei brad. My Hanna Stamps! finally arrived yesterday and I sat down ASAP to make a quick card with them!! I stamped Hanna onto Papertrey White CS (using Brilliance Graphite Black ink), masked her then stamped the A Muse Large Skinny Oval to have a spot of "ground". 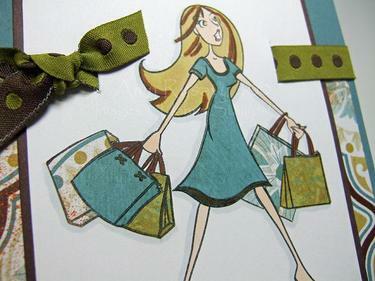 I used Copic markers to color her in, and paper-pieced a couple of the shopping bags with scraps of this Amy Butler Sola Paper (same paper used on the card base). The ribbon is new by May Arts and I *think* that All That Scraps will be stocking it soon but I'm not 100% sure on that. EDITED TO ADD - yup she did get it in! You can see it all here - it's such cool ribbon! To finish off the card I added 3 Bazzill Hershey brads and called it a day! You can see the whole Hanna set here - and FYI Kristi is offering FREE shipping (to ANYWHERE!!) for the month of October on all orders of Hanna Stamps!! About something ---- but now the cat's out of the bag and it's time to share!! I had been hoping to have samples in hand to post but alas fate has been working against me and I don't have the stamps yet! Which stamps am I talking about you ask??? Why it's Hanna Stamps, they're brand-spanking-new-not-yet-available-but-when-you-see-them-you're-gonna-want-them stamps!!!! Seriously they're uber-cute - when I was approached with the opportunity to be on the Design Team I really hemmed and hawed about it as I am kept pretty busy with everything I do now - but then Kristi gave me a sneak peek of the first set and I was SOLD!! As of right now the Hanna Stamps site is under construction - it's supposed to go live on Friday - and by then I'm REALLY hoping to have my stamps and a few samples made up - nevertheless I'll keep y'all updated on here. And don't forget to check out the other designer's blogs and whatnot b/c some of them already have their stamps and have posted their samples - and OMGosh are they ever CUTE! !